"41MR12, Line of Artifacts, 63" by Timothy K. Perttula and Robert Z. Selden Jr.
DECORATION: Engraved on the rim with the pendant triangle motif, consisting of horizontal scrolls on either side of a central circle or button element, and small pendant triangles both above and below the horizontal scroll. On this vessel, the central circle or button element is repeated twice on the rim. 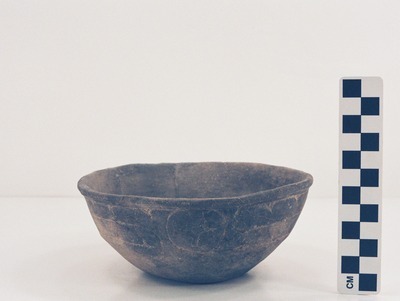 Ripley Engraved carinated bowl from the “line of artifacts” at the Ben McKinney site.